Fiber Flux: Free Crochet Pattern...Celebration Scarf! My little blog received its one millionth visitor last week! I am so excited and honored to be part of such a wonderful community of stitchers. Here is a scarf that I crocheted with some festive yarn I have been saving for a special project. It is a simple double crochet scarf, with a fun twist...instead of fringe, it has fun celebratory curlicues at either end! This is the perfect scarf for special person's birthday or other special occasion...the yarn reminds me of confetti and the curlicues are like party streamers! Thank you lovely stitchers for so much great fun, may we have many more adventures to come! Length: As long as you want...the scarf pictured here is 56 inches long. Row 1: dc in 4th ch from hook, dc in each ch. Row 2: ch 3 and turn. 1 dc in each space across row. Repeat row 2 until desired length, and take into account the curlicues when you determine length needed. 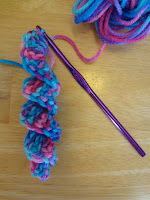 Each curlicue is 5 inches long, and with curlicues at either end, this will add an additional 10 inches to your scarf. Dc in 4th ch from hook, and 2 more dc in the same ch. 3 dc in each ch across row. Attach curlicues either by sewing them on with a tapestry needle, or by simply using the tails of yarn from the curlicues to tie them right onto the scarf. Weave in any ends. Beautiful, gorgeous, fun!!!! I love it, thanks to much for the pattern and a big congrats on your one millionth visitor!!!! Thank you so much! I'm saving this one for a special birthday present scarf. Wow! This is to die for gorgeous! I love the curlies. I am a knitter but I would love to learn how to do these. I wish I could make them by knitting. I just ordered some Tweed yarn. I plan to make a cowl. Keep up the great work! I love this scarf & the curliques! Even though it is an easy double crochet, the yarn makes it look a lot more complicated & sophisticated. I'm gonna have to go buy this colorway of Tweed yarn. I love it! I also love all your crochet patterns. I just wish I had time to make them all! :) Also, I don't knit but see a lot of patterns I wish I could make. LOL! Thank you so much! That yarn caught my eye in the store, I didn't know what I wanted to do with it at first, but I had to have it! This is a beautiful scarf! The curlicues caught my eyes right away and I had to tackle them. I do have a question though, what about blocking? I am questioning the effect of water on this yarn? What do you suggest? This yarn used for the project above is acrylic, so blocking probably won't make much (if any) difference. The scarf shown above was not blocked, it gave nice stitch definition and laid nice and flat, so I wasn't worried about it. "Product Care Instructions: Items made from this yarn may be laundered through the use of hottest available water, detergent or soap, agitation, and a machine designed for this purpose. A machine dryer may be regularly used at the hottest available temperature setting." I hope that helps! Happy crocheting to you! love your blog, I'm new to crochet as I sew for a living I actually can't put crocheting down once I start and I don't get that with sewing. A bit tricky cos I'm from the UK, your is our treble some times I forget. I sew iphone and ipad covers, so if you could come up with a pattern for gadet covers I'm sure it would be just has fantastic as all the rest of your stuff! Is there a knit version to this scarf??? I just can't get the hang of crocheting. :( I can get the same twist effect when I do my potato chip scarfs. I was wondering if there is a knit verson to this scarf? I just can't seem to grasp the crochet thing. :( I can get the twirls if they are like the potato chip scarf, just smaller. :( I am sure you are busy I have looked in a few diffrernt places to try and get this verson in a knit pattern. But can't seem to find one. I did try to crochet this and just ended up frusterated and stoped. Hi Jennifer - I'm wondering if you can let me know where you bought your yarn from? I can only find it to buy online in the United States, but nowhere in Australia. Cheers! This is super! I have been thinking of different ideas for trim on scarves, shawls , etc. I am a big fan of Bohemian Crochet and the dangling charms and braids and flowers! Madly crazy about learning howvto add these fun additions to my wor! Also! !..garland with flowers and leaves. Geometric shapes on braids! Gotta figure these necessary additions out! Also, I had just been noticing some accidental curliques appearing in my work and wanted to do it on purpose! I've even seen pics of patterns for sale with curliques replacing pompoms at the crown. Amazing and fun! I'm never giving up my love of all things Victorian, lacy feminine and frilly, but I NEED to have some of those fun, charming, free spirited adornments on upcoming, and some excisting, crochet projects ( never made a hat or scarf. Thanks to you reaching out to my request on NICE patterns for a "first scarf" , that first scarf is now under way! Now, you just graciously shared how to adorn it with a lovely bit of squiggly interest! Love your pavement and gelato scarves, and I can't wait to try this one! Your patterns are my favorite! Thanks so much for sharing them. Does using the J hook give is that lose look? I absolutely love this.♡ thank you. Since the yarn you used is super chunky, would I get the same gauge if I used two strands of, say a 4. medium yarn with the same size hook you used? I keep putting it off, thinking I'll be able to buy the recommended yarn next payday, and it's just not worked out that way. I do, however have a lot of 4 med. yarn to use up. I just adore those curliques! Your site has really grown! It looks good! This is such a lovely scarf. You have used great colour combination and I loved the curlicues. Its a perfect birthday gift idea. I finally have the right kind of yarn to make thus! Its the wrong color, but I'm hoping Mosaic looks ok... I'm having a hard time finding yarns in colorways I want, so I get what they have, I'm really excited to make this!